Colombia’s voters on Sunday elected Ivan Duque, an inexperienced dynasty politician, to lead the country through an ongoing peace process he has vehemently opposed. The election returns executive power to the “uribistas,” a group of conservative and far-right politicians centered around controversial former president Alvaro Uribe, who is being investigated on murder charges by the Supreme Court. Opponents have speculated that the hard-right leader of the Democratic Center party could try to influence the government, beyond his post as senator. Duque has been ambiguous about his loyalty. At a campaign rally he called Uribe “the eternal president.” But in debates the 41-year-old claimed to represent a new generation. He has not been compromised by the criminal investigations into his political patron. With both the International Criminal Court and the Supreme Court investigating war crimes implicating Uribe, the president-elect’s loyalty to his political patron could soon be put to the test. Duque’s plans to alter the peace deal with the FARC would have to either be approved by Congress or the Constitutional Court. Outgoing President Juan Manuel Santos is frantically trying to reach a ceasefire with ELN rebels that would be almost impossible for Duque to reject before the transfer of power on August 7 . Duque’s coalition consists of the uribistas and dissident Conservative Party members who successfully promoted the 2016 rejection of a peace deal with the FARC that sought to end more than half a century of violence between the Marxist rebels and the state. According to the national registrar, Duque and his running mate, former Defense Minister Marta Lucia Ramirez, received 53.95% of the votes, after counting more than 98.96% of the voting tables. His opponent Gustavo Petro, who promised to continue the peace process, received 41.83%. The turnout was 53%, the highest in 20 years. Because Petro reached the second round, the social democrat will be allowed to take a seat in the Senate. 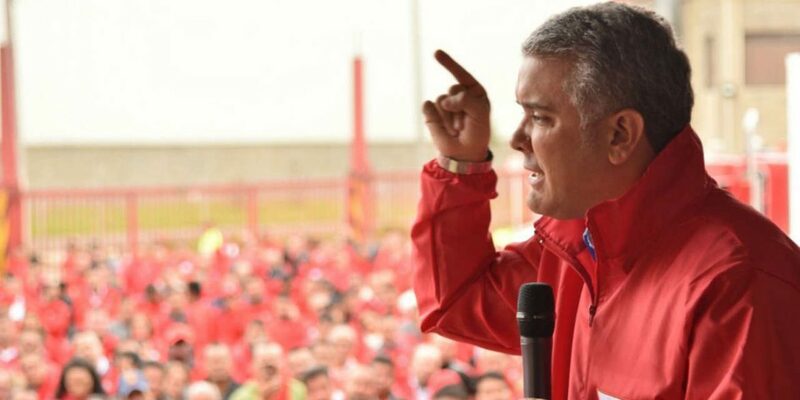 Duque won the elections with promises to effectively remove the FARC leadership from congress and change punishment for guerrillas who were involved in the drug trade. Furthermore, the conservative has only recognized the FARC as a victimizer in the conflict, leaving millions of victims of state violence and privately-funded paramilitary groups in the cold. The conservative has also vowed to renegotiate terms for talks with the ELN, the country’s last-standing guerrilla group that has been negotiating peace since February last year. The elections won by Duque were dominated by extreme polarization between the conservative and his social democratic opponent who even suffered an attack in March. Petro, a former guerrilla, has fiercely been denouncing corruption practices by the dynasty politicians that have dominated Colombia’s political system for centuries. Far-right supporters of Duque embarked on a disinformation campaign falsely claiming Petro was a communist who would convert the country into a second Venezuela, the neighboring country suffering a major humanitarian crisis. In the end, supporters of both campaigns were polluting public opinion with disinformation and exaggerated claims. Duque had been severely criticized by the press and election observers for his refusal to take part in election debates. Most moderate leaders have refused to endorse either candidate in protest of the polarization between the two camps. Despite the discontent over the ongoing peace process and the tensions between “uribistas” and “petristas,” the peace process with the FARC helped the elections become the most peaceful in decades.